The Juan Taking a Selfie Cartoon for PowerPoint is a casual template of infographic clipart character holding a phone. 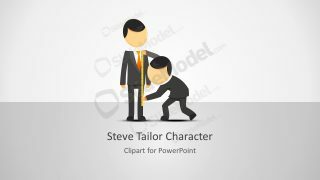 The presentation template shows a cartoon character in casual clothing taking a picture from mobile phone. Although, this depicts the act of taking selfie, the figure is also usable as a person holding mobile phone. 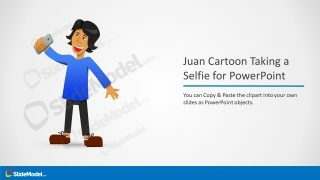 This PowerPoint of Juan taking a selfie can help provide the sense of humor in the presentation. 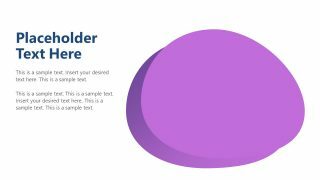 The layouts available in 4 slides of the template helps users to utilize various customization options available. 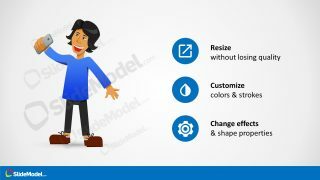 For example, the two content layouts in third slide gives suggestions to resize, customize or change the shape effects. 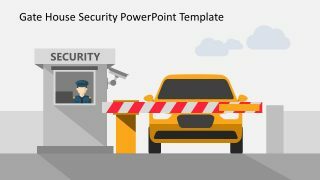 Whereas, the fourth slide present modification ideas specific to the clip art. 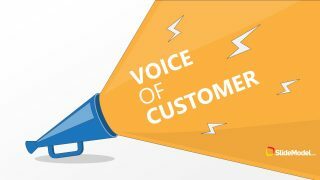 Such as, copy & paste, ungrouping, customization of figure. 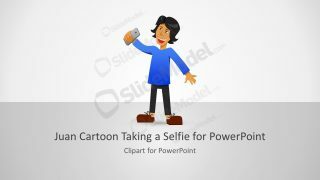 The clipart template of Juan Taking a Selfie Cartoon for PowerPoint has sample slides with infographic icons and text placeholders. These icons and textboxes are usable as an alternative of bullet points. The editing features enable users to make several changes in the design of clip art appearance. For instance, customize the skin color, hair, clothes, shoes and phone. To make such changes, select the particular shape i.e. face, hair, shirt or pants. Next, choose the color from shape fill pallet to apply. Further, it is easier to resize every object in the PowerPoint by simple mouse clicks. Additionally, the users can rotate and adjust the clipart icons to alter the Juan cartoon character clipart. 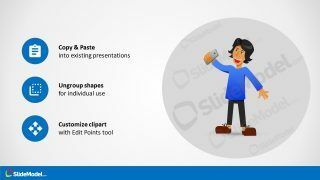 The cartoon template PowerPoint of Juan taking a selfie contains the elements which can be rearranged and reuse in another PowerPoint. The template avatar of Juan taking selfie can demonstrate number of presentation ideas. Such as, a social media marketing strategy, brand sales ideas to promote through selfie pictures and hashtags. Moreover, this is also presentable in seminar for human interaction and communication discussions. Like the self-obsess behaviors, negative impact of social and psychological problems associating to selfies etc.